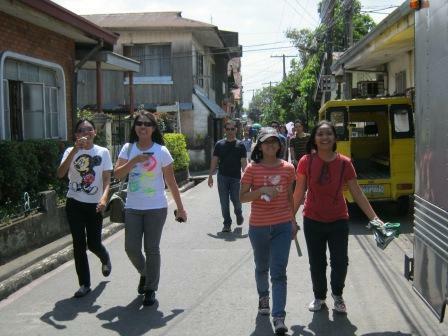 Right after lunch at The Beatles Place restaurant, the tour group proceeded to walk towards the Pakil Church which was just nearby. The tour bus was nowhere in sight because the bus driver was asked to park away from the church area. As we were walking, I noticed traffic to be at a very slow snail's pace. The streets were narrow and one thing that exacerbated the traffic was that some cars weren't even moving - because they were parked. Still, the other car drivers seemed to be just patient waiting for their turns to maneuver past these parked cars. Street parking shouldn't have been allowed. With the influx of churchgoers, a rerouting scheme with one-way streets should've been implemented. I'm just so glad I wasn't driving. So yes, that's another thumbs up for packaged tours such as this. 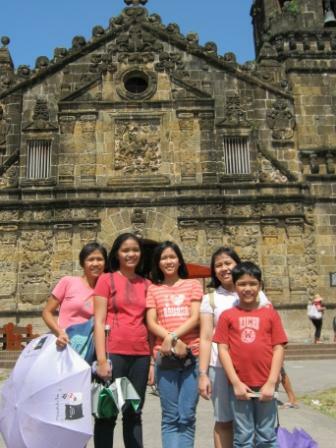 You can tell by our shadows in the photo below that it was high noon when we were at the Pakil Church. This was taken at the church's parking lot which, surprisingly, wasn't even full. Renz's tummy tells how much he thoroughly enjoyed our lunch. Apparently, the Pakil Church started out as a bamboo and nipa structure too. Here's the church's marker that's very descriptive of the changes that the Pakil Church has undergone. Did you know that the name Pakil came from a person's name? The chuch's dome interior is a sight to behold. Notice the intricate carvings and paintings. 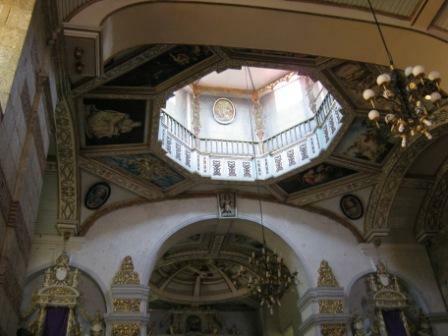 In contrast though, the Paete church's dome interior is simple and plain. This despite the fact that, presently, it's Paete that is known for its skillfull artisans in woodcarving. 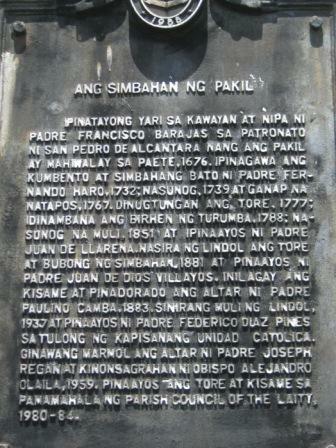 But then, as read from the church marker, Pakil was actually a part of Paete before. So, technically, the Pakil dome may have been done by Paete masterful woodcarvers. As seen below, this church had the most colorful statues ofsaints on display. It may have been the time (noon) that was the reason for the jampacked crowd, but almost everyone was taking pictures of the statues on the carrozas. This particular carroza had some interesting lights. If you look closely, you'd see that the lamps of the carroza have green transparent covers. These covers are actually cut-up bottoms of plastic soda pop bottles. Clever, isn't it? They're cheap, wouldn't break, and will give that greenish glow at the procession. The Beatles Place restaurant owner, Teresa Sanchez, actually gave a walking tour for us inside the church. She discussed a bit about Pakil's Turumba Festival and the town's other traditions. But the church crowd inside was just too big that it became hard to move around freely and even harder to hear her speak. After a few more minutes, after everyone in the tour was in the church, we saw the tour bus creeping by. 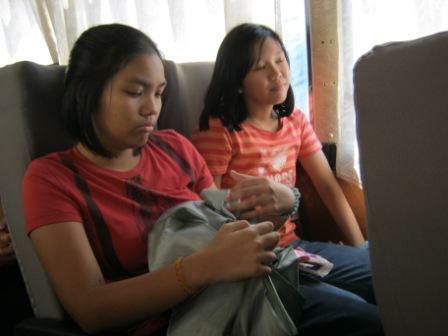 There was no big rush to get inside the bus because of the heavy traffic. 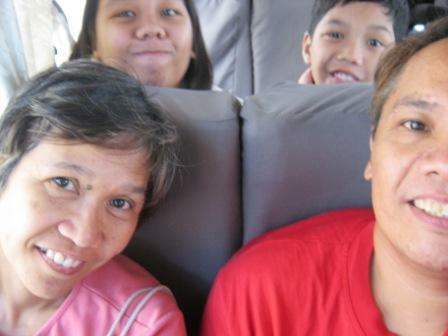 In fact with the bus at a standstill, I still managed to take a few photos of us in our seats. In the other side of the bus, Karen folds her umbrella while Sandra looks bored. It would be a few more minutes like this until we finally got out of the town proper. 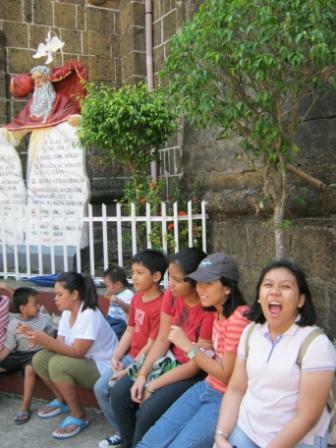 The trip to Paete church wasn't without its hitches. Again, we were warned that the bus won't be able to drive towards the church and park there. The streets are just too narrow for the bus to maneuver. 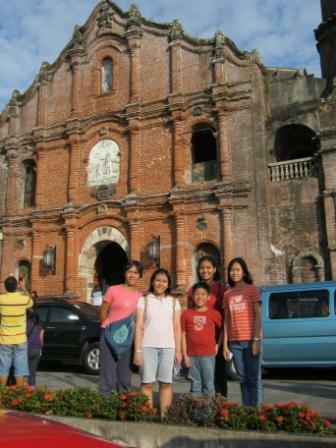 The tour guide announced that the feasible thing to do was to walk from the main road towards the Paete Church. Sounds of more groaning were heard from the older and snooty passengers. So we walked. 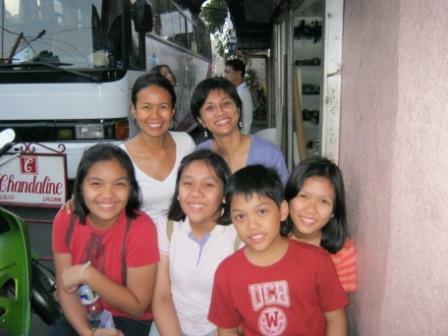 But as soon as we reached an intersection, a traffic enforcer there told us we can take a tricycle towards the church. Of course the tricycle drivers there were just happy to oblige. The church's belfry is easily visible from the intersection and so we decided to walk instead. Well, that's except for the older and some other snooty passengers who'd rather not walk and took the tricycle. You can see from the picture above how narrow the streets are. The street went straight up to the church. Those parked vehicles are on the sidewalk or whatever's left of it. Some of the streets have become one-way and tricycles have no recourse but to go a longer and circuitous route to go to the church. We were glad to have walked because we reached the church even ahead of the tricycles. Putting down umbrellas for a photo right in front of the Paete Church. 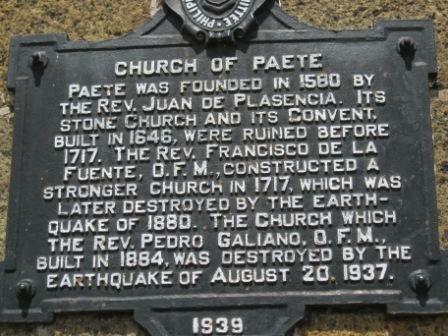 The church marker mentions a couple earthquakes that ruined Paete Church. As in the other churches, beautiful carrozas lined up the sides of the church's interior. 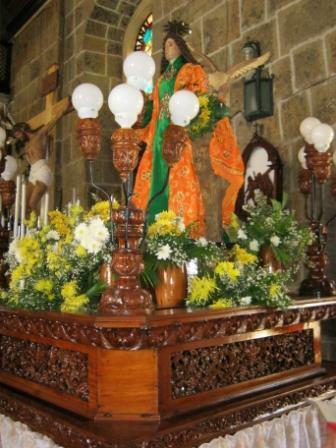 These will be used in the town's procession at night. 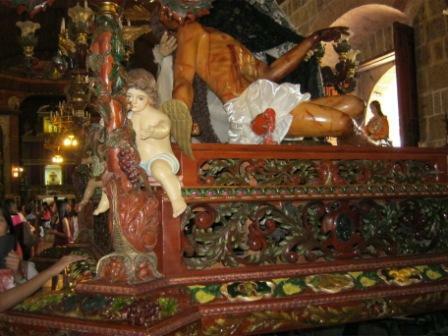 Notice the intricate wood carvings on the carrozas in the photos above and below. Well you do know that Paete got its name from Paet, meaning chisel. 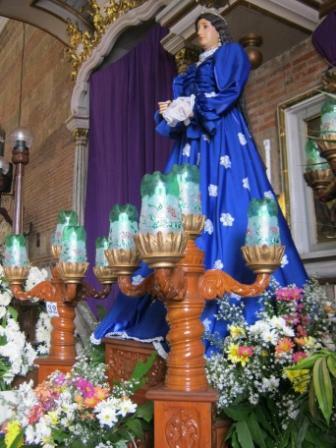 Before the Spaniards came, Paete was said to be a peaceful barangay under Gat Lacampauid. The Spanish friars had a tradition of naming towns they built in honor of saints. Paete was an exception. Legend has it that there was once a young Franciscan priest who was tasked by his superior to visit their newly-founded settlements alongside Laguna de Bay. The priest knew little about the terrain so he asked a native the name of the place. 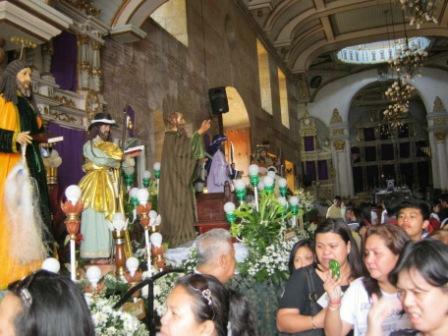 This was a Maundy Thursday and at the side of the church there was some sort of senakulo taking place. Vendors selling wooden carvings abound. No, I'm not interested in buying such items. I generally dismiss these as dust collectors. Again, we walked down the street to go back to the bus. There were a couple of locals petting a python - that's right - a python, along the street. Maybe it was bad, but I thought it was funny, that unsuspecting churchgoers got scared out of their wits upon seeing the python move. This is one stop where there were other tour buses parked other than ours. In fact, the buses were parked beside what looked like a covered basketball court. And that's where we passed through - the basketbal court. Here's one church that actually has a lawn in front. Another old church, you might say? Well, not quite. On the right side was a short flight of stairs leading to what looked like a second floor. Here, we found this marker in a corner. 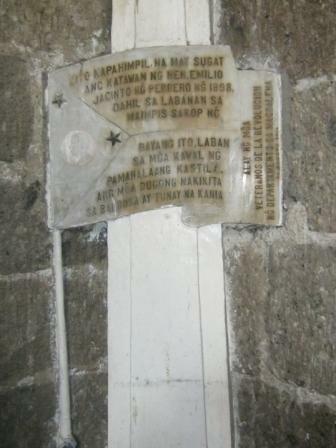 It's a marker saying the Brains of the Katipunan, Emilio Jacinto, was mortally wounded in an encounter with the Spanish forces in the battle of Maimpis. He sought refuge in the church and today, in this corner, there's a glass enclosure showing the blood stains on the original brick steps of the convent. Finally, the last church for this year's Visita Iglesia. 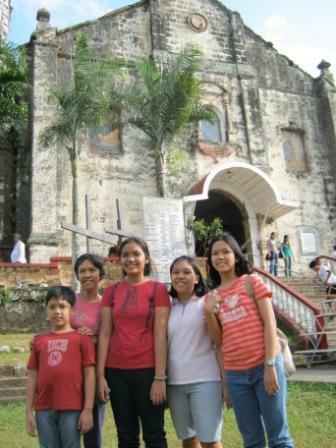 In our Pahiyas 2009 road trip, we visited this area, but not the church itself. 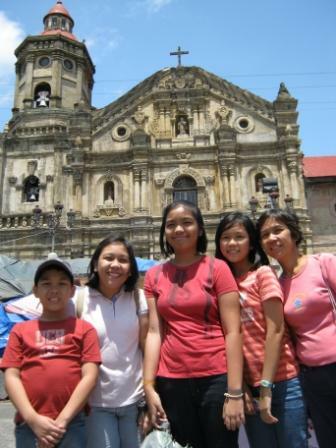 We were here for the Tsinelas Festival of Liliw. Liliw church is remarkable for its red brick color that's why it's so easy to remember. The last leg in today's itenerary is Halo-halo Liliw's Fastfood located at Gat Tayaw St. 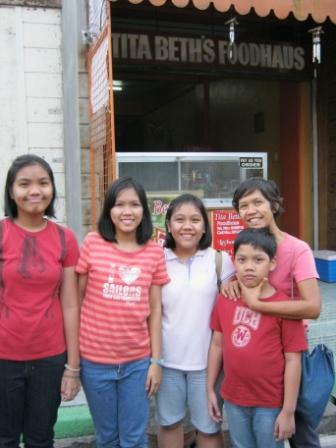 This is the same restaurant where we had refreshments in the 2009 Pahiyas. There must've been some confusion however because the place was closed. Our tour coordinator, Dinah Rose, lost no time in locating another restaurant. And that's how we ended up at Tita Beth's Foodhaus. 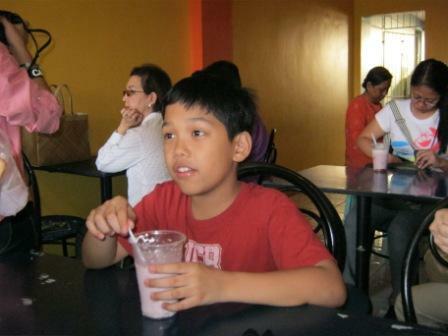 Renz enjoying his halo-halo. Incidentally, we're among the first again to be served. That's because we followed Dinah from the church while others stayed longer at the church. After refreshments, we got back to the bus only to learn that the battery needed replacing. This meant more time to look around Gat Tayaw St. 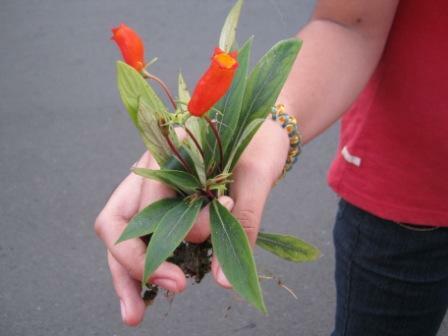 Here DH takes some sidewalk plants with pretty red flowers to while away the time. With just the rose cuttings and these pretty red flowered plants, it's been a meager haul. See how nice these red-orange flowers are. The plant below is Seemannia sylvatica, also called Bolivian Sunset. The kids bought some locally made food products. 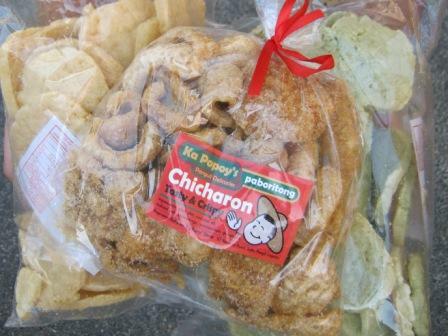 Here's a favorite at 3 for Php 100: 2 Kropek bags and Chicharon. Finally, the battery's fixed and for posterity, a photo of the kids with Dinah Rose and Peachy. Hi, Blackdove. Thank you for visiting my site. Bosay Resort in Antipolo, Rizal has an olympic size swimming pool. You might also want to consider Club Manila East, Taytay. They have lap pool for training.